Normally, I end my reviews with a thank you note. But, this time I can’t follow the routine. After all, this is a special book and hold a super-special place in my heart. 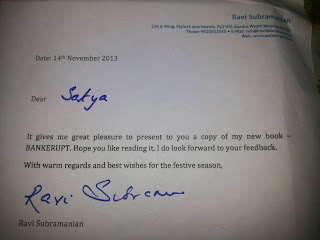 All thanks to the author of Bankerupt, Ravi Subramanian, for sending me a personally autographed copy of the book for review. It was a proud moment for me. It was totally unexpected and I was let speechless. I thank the author for the book. 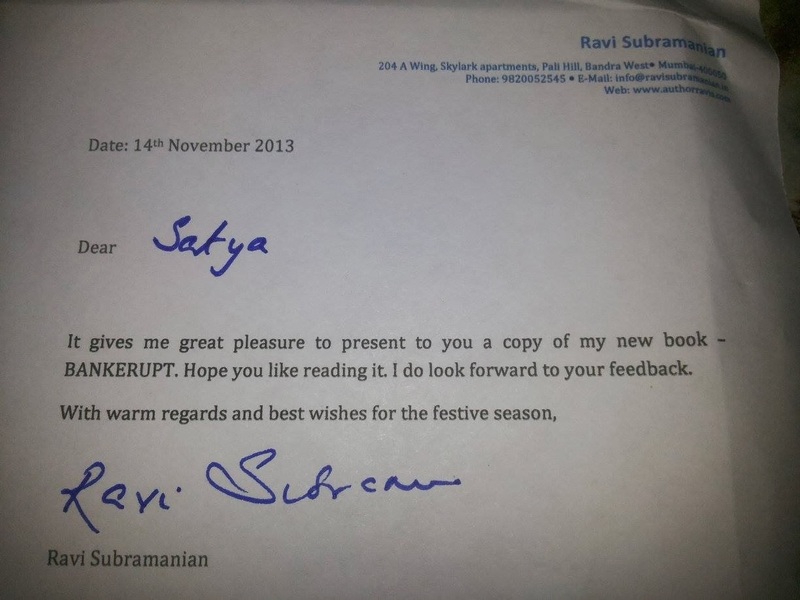 I wish him all the best for this book and many more that would line up in coming years. And, of course, I thank Locomente for all the opportunities it throws!! A university is an institution for higher education and research. It can also be a place where academic brilliance leads to overinflated egos, bitter politics and finally, murder. Cirisha Narayanan, a professor who has risen meteorically, stumbles upon a cryptic message. Aditya Raisinghania, her banker husband, sets up a highly innovative financial hoax. Her profiteering father harvests Australia’s largest bird the emu in India. The US elections are on and the debate on gun control has reached a fever pitch. Set in Mumbai, Coimbatore and Boston, Ravi Subramanian creates an impeccably researched world where everyone has a motive to kill. Nothing is as it seems in this cunningly vicious thriller where the plot turns on a dime. His earlier works are - If God was a Banker, Devil in Pinstripes, The Incredible Banker and The Bankster—based on financial crime. Cirisha Narayanan – An ambitious and career oriented girl who works as a research associate in Social Psychology at MIT. She believes in honesty and thrives hard to take the right path. Aditya Raisinghania - An investment banker at Greater Boston Global Bank, Mumbai. He is also career oriented and ambitious. He cares more about the end than the means. Then, there are a whole bunch of other characters who stay in our heart and help the story move towards the most anticipated climax. The book is crisp and the editing is done commendably. The suspense is maintained throughout which makes it an interesting read. The cover page fits to the mood of the book. The author has stood up to reader’s expectations and climbs a step higher as far as the standard is concerned. The author, being a former bank employee, knows what he says. That makes the plot believable and accelerates its charm. Three different plots goes on simultaneously. At times, it could be confusing. But hey! This is like so small compared to the goodness it offers. Do you love John Grisham? Does thrillers thrill you? Are you fed up wih the chicklits and love stories that Indian authors come up with and do you look forward for a different flavor from Indian authors? If the answer is YES for any/all the questions, go for it.